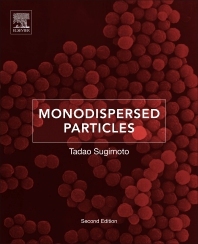 Monodispersed Particles, Second Edition, covers all aspects of monodispersed particles, including inorganic and polymer particles and their composites. The book describes their fundamentals, preparation, analyses, and applications, covering both the theoretical approaches and practical applications of surface energy of particles, metal monocrystals, anisotropic growth, monodispersed systems, electrochemical preparation of dispersions, tubular structures, detection and manipulation of biological particles, and photochromics and other light-sensitive particles. This second edition is fully updated and revised, with 130 new pages on recent progress in the field of nanoparticles. Part 1 Fundamentals. Nucleation. Surface energy. Equilibrium concentrations of three-dimensional nuclei. Nucleation rate. The nucleation process in closed monodisperse systems. The nucleation process in open monodisperse systems. References. Growth. Equilibrium concentrations of two-dimensional nuclei. Nucleation rate of two-dimensional nuclei. Growth rate by surface reaction. Growth of polyhedral particles by surface reaction. Diffusion-controlled and reaction-controlled growth modes. Criteria for the distinction of growth modes. References. Habit Formation. Surface chemical potential of a crystal face. Stable forms. References. Recrystallization. Phase transformation. Ostwald ripening. Self-recrystallization. Reversed Ostwald ripening. Contact recrystallization. References. Solid-Solution Formation. Equilibrium compositions. Conversion by intra-particle recrystallization. References. Part 2 Preparation. General Principles for the Formation of Monodispersed Particles. Separation of the nucleation and growth stages. Inhibition of random coagulation. Reserve of monomers. Choice of growth modes. Introduction of alternative mechanisms. References. Monodispersed Systems. Classification of monodispersed systems. Homogeneous systems. Heterogeneous systems. References. Control of Particle Characteristics. Size control. Shape control. Internal structure control. Composition control. Layered structure control. Hollow structure control. Porous structure control. Heterojunction. References. Part 3 Analysies. Analyses of formation processes. Electron microscopy. X-ray diffractometry. Infrared spectroscopy. Ultraviolet-visible spectroscopy. Potentiometry. Inductively coupled plasma spectrometry. Gas chromatography. Ion chromatography. Radiochemical analysis. Seeding analysis. References. Characterization of Products. Transmission electron microscopy. Scanning electron microscopy. Electron diffractometry. Energy dispersive X-ray spectrometry. Powder X-ray diffractometry. Oriented particulate monolayer X-ray diffractometry. X-ray photoelectron spectroscopy. Infrared spectroscopy. Ultraviolet-visible spectroscopy. Photon correlation spectroscopy. Turbidimetry. Coulter principle. References. Part 4 Applications. Application to Fundamental Studies. Determination of the Avogadro number. Measurement of zeta-potential. Determination of Hamaker constants. Measurement of interparticle forces. Studies of particle adhesion. Studies of colloidal ordering. Studies of light scattering. Studies of optoelectonic properties of fine particles. Studies of ionic properties of fine particles. Studies of magnetic properties of fine particles. References. Industrial Applications. Photographic materials. Ceramic materials. Magnetic recording materials. Catalysts. Pigments. Biological and medical uses. References. Name Index. Subject Index. Dr. Tadao Sugimoto is Emeritus Professor at the Institute for Multidisciplinary Research and Advanced Materials Processing, Tohoku University, Sendai, Japan. His specialties include physical chemistry of colloid and interfaces, synthetic chemistry of fine particles, and materials chemistry. He has been previously employed with the University of Tokyo, Clarkson University, Fuji Photo and Fujifilm, and Manazuru Institute for Superfine Particle Science. Dr. Sugimoto has published books with Elsevier and Springer. He has 41 patents on photosensitive materials and 3131 citations.